HERE IS A PHOTO of Saint Henry Church, in Charleston, Missouri. This church is a part of the Diocese of Springfield - Cape Girardeau, and is located in Mississippi County, about 148 road miles to the south-southeast of downtown Saint Louis. Although the church was open, I was unable to document the interior, because it was busy at the time. The first settlers of Texas Bend near the northern boundary of Mississippi County, were German Catholics from the vicinity of Cincinnati, Ohio. The log church at Texas Bend was the successor of the log chapel built in 1839 by Father Brands at Tywappity Bottom, though not built on the same spot. Both structures have disappeared; only the grave-yard of the second church of St. Francis deSales in Tywappity remains. 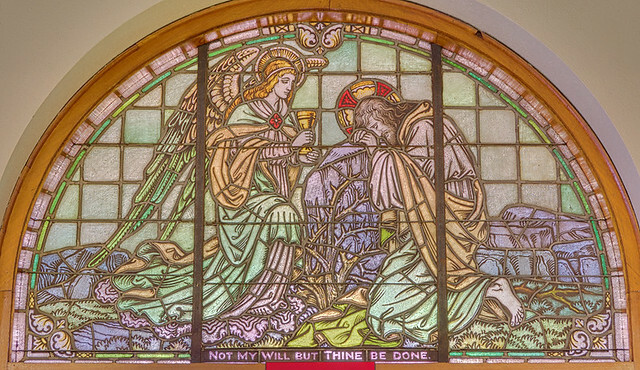 In 1873 Father Henry Willenbrink built the frame church in Charleston and named it St. Henry. This was the parish church of all Mississippi County. Father Bettels became its pastor in 1876, but resided and taught school at the Bend. The present fine brick school building was erected by Father Francis Brand. The ten years between Fathers Bettels and Brand are filled out by the rectorships of Father J. A. Connolly, Frederick Klein, Frederick Pommer, John A. Gadell, Hugh O'Reilly and Henry Thobe. 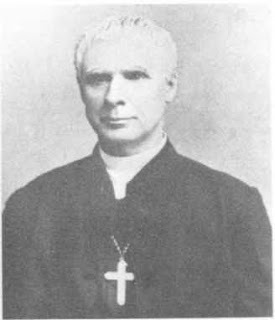 Father Henry Hussmann, who became pastor of the parish in 1895, built the beautiful new church of St. Henry, which was dedicated by Archbishop Glennon on June 4, 1907. Missouri is near the center of the United States, both geographically and culturally. 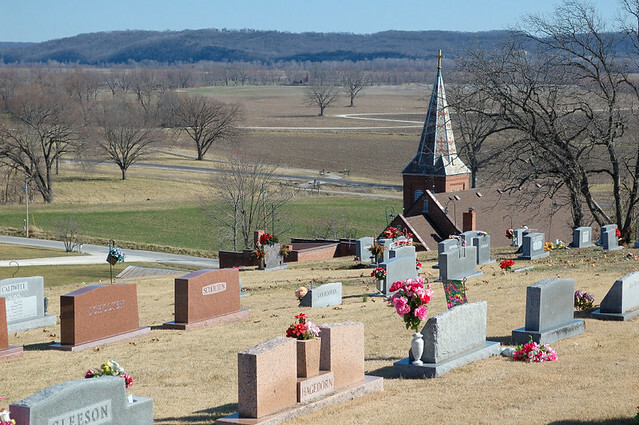 While much of the state — particularly the portions near Saint Louis — can fairly be called ‘Midwestern,’ this church is located in the region of the state’s ‘Bootheel’ which has a Southern culture. Southern Baptists appear to make up the plurality of this region, but the early Catholic colonial presence along the great rivers of the central U.S. planted Holy Mother Church here. SAINT MARK is the writer of a Gospel, which follows the teachings of Saint Peter. We are told that Mark’s mother was a friend of Peter, and that Mark was a Levite, or Jewish priest. That he has a pagan name, Marcus, after the Roman god of War, should not be surprising, since the Jewish people were long subjugated to foreigners, and that the Temple priesthood and leadership — contrary to the Pharisees — tended to encourage enculturation. Tradition says that Saint Mark founded the Church in Egypt, also known as the Coptic Church, and he is highly honored there. 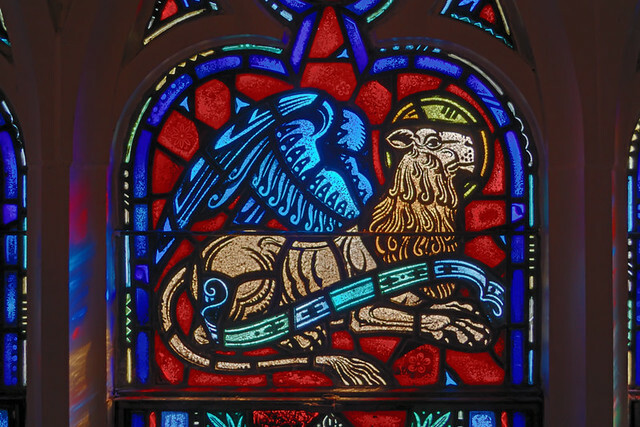 Saint Mark is patron of notaries, lawyers, lions, prisoners, glaziers and stained-glass window makers, and against insect bites, impenitence, and certain diseases of the neck. He is also patron of those named Mark! A Coptic icon of Saint Mark, shown with the attributes of a lion, a codex, and a quill. Found at Saint Mary and Saint Abraam Coptic Orthodox Church, in Saint Louis County, Missouri. Anyone not familiar with Church iconography should know that icons are not meant to be photographic or naturalistic, but rather are used in devotion — directly, in the Eastern Churches, and usually as a pious reminder in the Latin Church. If you see an icon of a man with a lion, and the man is writing a book, then the man depicted is undoubtably Saint Mark the Evangelist. As far as I know, there is no legend about Saint Mark meeting a lion, but this is instead a symbol with deep scriptural roots. Now, one could instead claim that this symbolism is only for the benefit of the illiterate, that a modern icon should be naturalistic, and should have the name of the Saint written out in text. But in what language should this be written? A good icon should be useful for at least a couple of centuries, or perhaps even a thousand years or more with maintenance. Languages changes, nations rise and fall, and peoples and icons migrate — and migration among the Copts has increased greatly due to recent persecution from the so-called ‘Arab Spring.’ Those who argue against the icons have too many false assumptions than can be refuted here. At Saint Mary's Catholic Church, in Alton, Illinois. A winged lion, with a halo and a scroll. Mosaic, found in the narthex of the Cathedral Basilica of Saint Louis. The Saint's relics are entombed at the Patriarchal Cathedral Basilica of Saint Mark, in Venice, Italy. The interior design of the Cathedral Basilica of Saint Louis is based on that ancient Venetian church. Saint Mark Parish, in Saint Louis County. This view shows the World’s Fair Pavilion atop Government Hill, in Forest Park, in the City of Saint Louis, Missouri. Teenagers are seen here enjoying the cool water of the fountain on a warm June day. I think this photo adequately captures the joy and simple pleasure that ought to be found in a pleasant park. St. Louis has great parks. And St. Louisans are passionate about them. 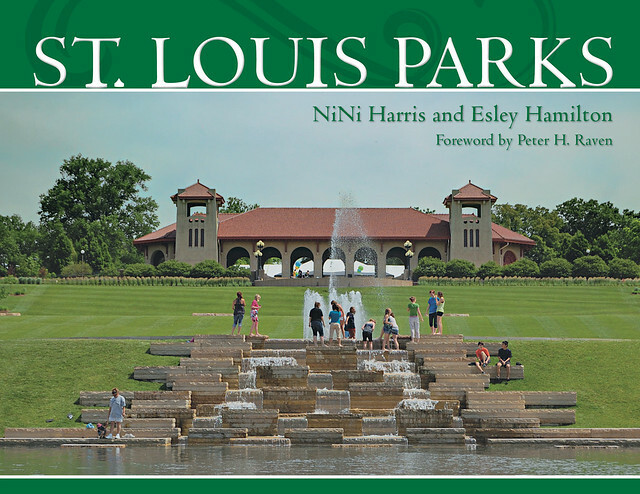 St. Louis Parks delivers portraits of St. Louis City and County parks, both major and minor, that prove why these common spaces are crucial to the region’s way of life. Acclaimed local historians NiNi Harris and Esley Hamilton take readers through the city and county, respectively. Starting with the establishment of Lafayette Park from thirty acres of common fields in 1836, Harris covers the creation of gems like Tower Grove Park, the nation’s finest Victorian Park, and the dazzling, 1,293-acre Forest Park, while including Citygarden, and its interactive artwork, in the heart of downtown. In the county, Hamilton highlights one-of-a-kind attractions like the renowned Museum of Transportation and Laumeier Sculpture Park, the Butterfly House and St. Louis Carousel at Faust Park, a farm zoo at Suson Park, and the military museums at Jefferson Barracks. 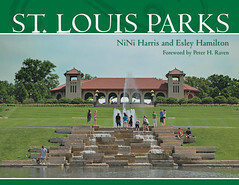 In both sections, the authors recognize the citizens, civic leaders, and architects whose work delivered to all St. Louisans picturesque landscapes, ball fields, tennis courts, natural savannahs, and grasslands filled with wildlife, and trails that lead runners through forests and by shimmering lakes. Dramatic photography by Mark Scott Abeln and Steve Tiemann complement the essays. The photographs evoke the unique character and history of the individual parks. They visualize the importance of green space for both escaping and coming together as a community. NiNi Harris’s earliest memory is of an early autumn evening, picking up acorns as she and her father walked along Bellerive Boulevard to Bellerive Park. Her great- great-grandfather’s first job when he arrived in St. Louis in 1864 was planting trees in a St. Louis park. This is her tenth book on St. Louis history and architecture. ists in the St. Louis region, Hamilton’s is a household name. He teaches the history of landscape architecture at Washington University and serves on the board of the National Association for Olmsted Parks. Steve Tiemann graduated from McCluer High School and went on to obtain his forestry degree from the University of Missouri at Columbia. Steve has enjoyed his career as a park ranger and park ranger supervisor with St. Louis County Parks for nearly thirty years. He tries to be in ready mode with a camera while patrolling on foot or bike. Mr. Peter Raven is President Emeritus of the famed Missouri Botanical Garden. 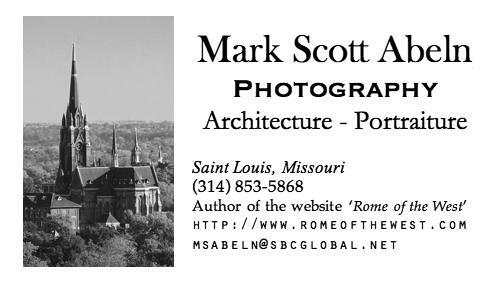 You can also purchase my earlier book of photography, Catholic St. Louis: A Pictorial History, by clicking the “Buy Now” button seen in the sidebar on the right. THE RADICAL REPUBLICANS gained control of the Missouri legislature by the close of the American Civil War. This political faction has a mixed reputation: they pushed hard for the elimination of the foul institution of slavery and worked to ensure the civil rights of freed slaves, yet they grasped for power, were heavily involved in bribery, trod over the rights of other citizens, and were opposed to any reconciliation with the brutally devastated South. Members of this faction drafted a new Missouri Constitution, which not only freed all slaves unconditionally, but also severely punished Southern supporters. It is unclear if many of the constitutional convention attendees were actually legal residents of Missouri; likewise, voting for the constitution was also highly irregular, with many ballots being sent out-of-state. A particular feature of the Radical Constitution of 1865 was that it required all teachers, physicians, clergy, lawyers, government officials, officers and managers of corporations, and voters to take a ‘Test-Oath,’ declaring that they never supported the Southern cause, among other things; the oath was so severe that only Radicals could honestly give it without perjury. Gentlemen: I thank you for your encouraging words and generous present. Your kindness imposes on me the obligation of devoting myself anew to the defence of your principles. You term Religious Liberty a God-given right. So it is. Let me add. You need not thank anyone but God for it. God is the source of Right and Power. He has said to those sent by Him to teach His religion: “All power is given to me in heaven and in earth. Going therefore teach ye all nations. And behold I am with you all days, even to the consummation of the world.” In virtue of this power, He sends us to teach and promises to be with us. His authority is ours. Were it man's authority, man would not now oppose, nor from the beginning have opposed, its exercise. The Civil Authority has been ever, from the days of Herod, the enemy of Christ. Christ therefore could not have entrusted to it, the care of His heavenly teaching. He appointed others besides civil rulers for this purpose. By His appointees He has stood unto this present day; and by them, as sure as His word faileth not, He will stand until the end of the world. It is very foolish then in the Civil Government, to assume an authority that does not belong to it, and to declare in contravention of God's ordination, who shall or shall not preach or teach the Gospel of Christ. This rash assumption of authority by the Civil Government, in a matter that does not belong to it, and over which it has no control, is as weak, silly, and tyrannical as the act of Xerxes, flogging with chains the tossing waves of the sea to make them do his will. One would think that the Civil Power would now at least in this more enlightened age of the world, cease its impotent rage against the Church, knowing as it does after its many defeats, vain struggles and humiliations, that the Church will obey only its maker, and that chains and prisons have no terror for it. And if we should prove recreant to our duty in this respect, we would accomplish nothing for the Civil Power thereby. The liberty of perdition would be of no avail to us or to it. Against us and against it, Christ would still maintain His Church. He would raise up others in our place, who would obey His voice and do His will. In obeying the Church and the state in their respective spheres, we are most obedient to law. We obey God first, our country next, and ourselves last. It is the inversion of these principles that we fear, and that would work the greatest detriment to the State and civil society as well as the Church. The question now pending is not one merely of loyalty or disloyalty, past, present or prospective. The issue is, whether the Church shall be free or not, to exercise her natural and inherent right, of calling into or rejecting from her ministry whom she pleases; whether yielding to the dictation of the civil power, she shall admit those only who according to its judgment, are fit for the office; or, admitting these to be fit, whether she shall not be free to call in those also who, though at first not fit, afterwards become so through pardon and repentance. The question is whether the Church is not as much at liberty, and as fully competent now-a-days, as at the beginning, to call in as well the saints as those who were sinners, as well the Baptist and Evangelist as St. Peter and St. Paul, the persecutor and denier of the Redeemer as well as his presanctified messenger and beloved disciple. With all these questions the State has nothing to do. Their decision is the high and unapproachable prerogative of the Church, under the guidance of her Redeemer, who alone is the searcher of hearts, and whose power it is to call in or reject whom He pleases. And now before we part, let me bid you be neither despondent nor disheartened. God is with you; who then can be against you. The history of the past is the index to the future. What, though we be cast into prison? What, though pains and penalties await us? What, though cells and dungeons be multiplied to debar us from our liberty? Still, the victory of evil will not be complete. Liberty and truth, ever superior to force, will defy the torturer to subjugate them. The momentary triumph of the wicked and the cruel, will be branded with perpetual shame. And out from those dark dungeons and dreary cells, will shine forth a cheering light, to bid all good men hope, and to show by the contrast who are the truer friends of religion and country—they who uphold liberty by the sacrifice of themselves, or they who sacrifice liberty to the unauthorized control of a usurping power. Be firm, yet patient, in the defence of right. This is the christian's struggle for the christian's crown. Let no violence characterize your actions as evil. Bless and pray for those who persecute you, for they are your rulers still. Respect and obey them, consistently with the reverence and obedience you owe to God. To-day, as of old, the religion you profess is ever the same. It bids you, if needs be, to die for Christ, but not conspire against Caesar. Thanking you, Gentlemen, from the fullness of my grateful heart for your kindness and devotion, I pray God to bless you, and strengthen you with the armor of faith; yea with that faith that giveth victory and overcometh the world, that by it you may prevail against your enemies. May God bless you, the Father, and the Son, and the Holy Ghost. Amen. Fr. John Cummings, a young priest of Archdiocese of Saint Louis, and pastor of Saint Joseph Church in Louisiana, Missouri, was arrested for failing to take the oath. He filed a lawsuit, which eventual went to the Supreme Court of the United States. The Test-Oath was declared unconstitutional in 1867, in the case Cummings v. The State of Missouri. The final decision was split 5 to 4, with Radical justices opposing. Despite this setback, the Radicals retained much power, further alienating their opponents, eventually leading to a severe reaction later in the 19th century, with repercussions that continue to our present day. Peace was not wanted, and so peace was not found. This letter is taken from a book by Bishop Hogan, On the mission in Missouri, 1857-1868, a remarkable work that I quoted at length here. The Bishop’s comments regarding religious liberty are rather appropriate at this time. THEN THE PHARISEES going, consulted among themselves how to insnare him in his speech. And they sent to him their disciples with the Herodians, saying: “Master, we know that you are a true speaker and teach the way of God in truth. Neither care for any man: for you do not regard the person of men. Tell us therefore what do you think? Is it lawful to give tribute to Caesar, or not?” But Jesus knowing their wickedness, said: “Why do you tempt me, you hypocrites? Show me the coin of the tribute.” And they offered him a penny. And Jesus says to them: “Whose image and inscription is this?” They say to him: “Caesar’s.” Then he says to them: “Render therefore to Caesar the things that are Caesar's; and to God, the things that are God’s.” And hearing this, they wondered and, leaving him, went their ways. Here in the United States, federal income tax is due on Tuesday. I’m sure that many of my readers, if they have been doing their taxes, have been reminded of this scripture passage lately. Like the Pharisees of old, our leadership in the federal government likes to “heap up burdens” on the people — see Matthew 23 — without lending a hand, while all the time greatly enjoying the privileges of their offices. If we take the total tax burden in the United States as a percent of total income, and superimpose that on the calendar, then the first 108 days of the year are spent on taxes. By coincidence, the day this year when taxpayers start earning money for themselves also happens to be the same day that taxes are due, April 17th. Men always work harder and more readily when they work on that which belongs to them; nay, they learn to love the very soil that yields in response to the labor of their hands, not only food to eat, but an abundance of good things for themselves and those that are dear to them. That such a spirit of willing labor would add to the produce of the earth and to the wealth of the community is self evident. And a third advantage would spring from this: men would cling to the country in which they were born, for no one would exchange his country for a foreign land if his own afforded him the means of living a decent and happy life. These three important benefits, however, can be reckoned on only provided that a man's means be not drained and exhausted by excessive taxation. The right to possess private property is derived from nature, not from man; and the State has the right to control its use in the interests of the public good alone, but by no means to absorb it altogether. The State would therefore be unjust and cruel if under the name of taxation it were to deprive the private owner of more than is fair. Pope Leo proposed that individual families ought to directly own the means of supporting themselves, in cooperation with local government, and with low taxes. However, the laws of the United States, from its founding, have aimed to break up the accumulated wealth of the middle class, and the burden of taxation on the poor can be overwhelming. Please consider that a poor, homeless, alcoholic bum, who only buys liquor, will pay the highest marginal tax rate of any American. Self-employment taxes are also exceedingly high, so that a sole proprietorship will have an excess burden compared to large employers. Likewise, high social security taxes prevent the working classes from accumulating enough wealth to support themselves. The nasty and divided political climate in the United States today could be greatly lessened if the federal government follows the Constitution and leaves most decision-making “reserved to the States respectively, or to the people.” Presidential election races are so contentious only because too much power has been accumulated by the Presidency — if this power were limited to only foreign affairs and to moral leadership, then the electorate would more certainly elect the most-qualified person for the job, and do it in a more peaceful manner. 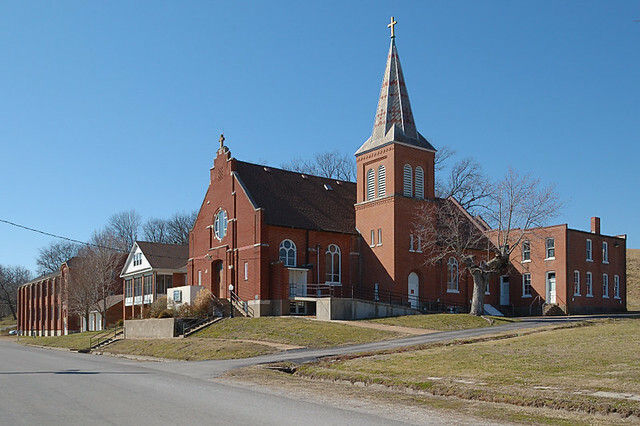 HERE ARE PHOTOS of the former Saint Joseph Church in Rhineland, Missouri. In 1979, this church was merged with Saint Martin’s in nearby Starkenburg, forming a new parish, the Church of the Risen Savior, named after Christ and His resurrection. 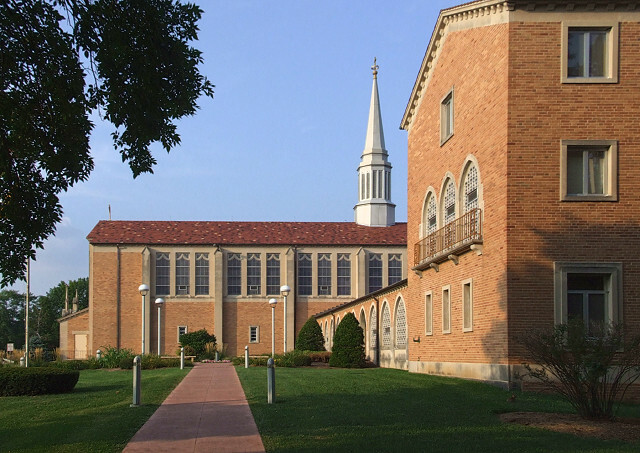 A part of the Diocese of Jefferson City, this church is located below the north bluffs of the Missouri River in Montgomery County, about 84 highway miles west of downtown Saint Louis. This church is associated with the Shrine of Our Lady of Sorrows in Starkenburg. 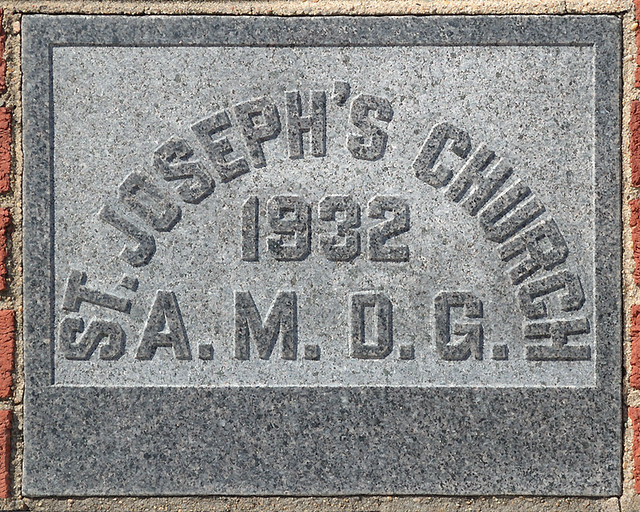 Saint Joseph’s Church, named after the foster-father of Our Lord, and patron of the Universal Church, was originally built in 1913. 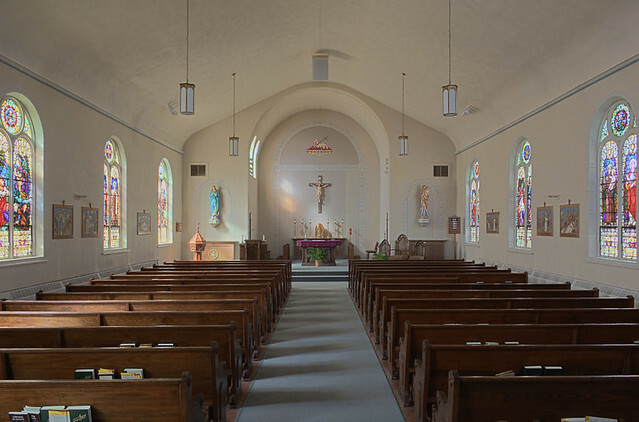 Before this time, Catholics hereabouts attended Saint Martin’s Church in Starkenburg, founded in 1847, and located about three miles to the northwest of here, atop the bluffs. A printed history of these parishes may be found here, but alas, very little of this parish’s history can be found online. ...south- central Loutre Township. Laid out in 1853 by Andrew Rincheval and named for the river of Germany. 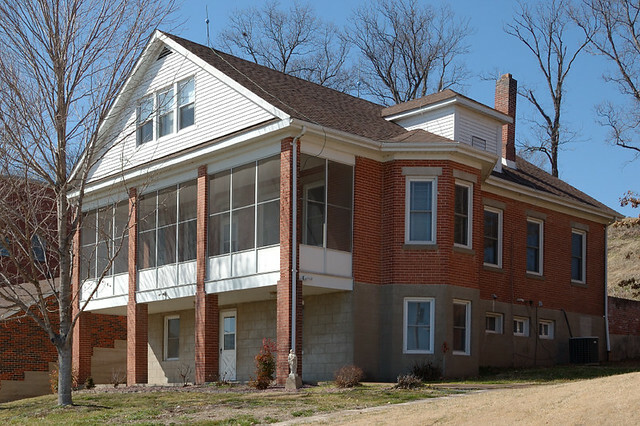 As early as 1837 German emigrants, who had located in Gasconade County, across the river, had begun to make a settlement here. Rincheval was killed by bushwhackers in 1863. The newer town on the M.K. and T. Railroad was laid out on November 1, 1892, by Louis Grotewiel. The lower Missouri River valley was once the home of various tribes of Indians, with European settlement by the French starting in the 1700s. This region was later settled in the first half of the 19th century by German immigrants who found the region similar to the valley of the Rhine. These immigrants brought their grape growing and winemaking skills with them, eventually developing the Missouri valley into one of the major regions of wine production in the U.S. until Prohibition. This region is again becoming a major producer of wine, with many vineyards on the south-facing bluffs above the river. Immigration from Germany became a flood after the failed revolutions throughout Europe in 1848. This had great significance for the United States in the run-up to the American Civl War: formerly a solidly Southern state, large numbers of freethinkers and liberal Protestant Germans swung the politics of Missouri towards the Union. But along with the German Radicals, fellow countrymen who were Catholic also settled in this region, and these typically wanted peace and not war. Circuit riding Jesuits often provided the Sacraments to early settlers in this region. Later, under the anti-Catholic kulturkampf of Germany’s Chancellor Bismarck, who eventually imprisoned or exiled all of the bishops of his realm, many more Catholics came into this region, including Franciscans who eventually staffed parishes hereabout. 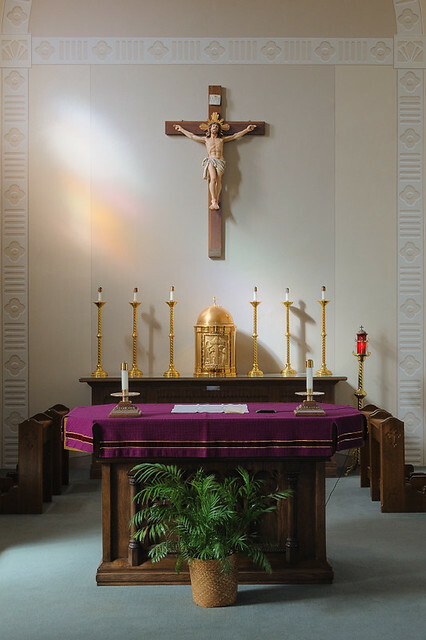 I took these photos back in February, during Lent, and so the altar is decorated in liturgical violet. The stained glass windows are of fine quality. Here is Saint Anne with the child Mary, and Saint Clare of Assisi. 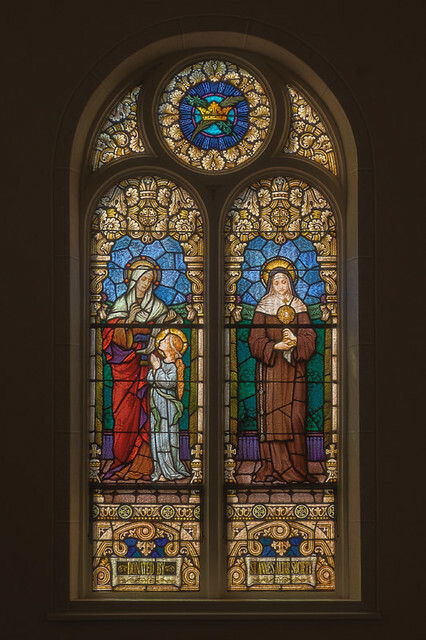 Saint Catherine of Alexandria and Saint Therese of Liseaux. 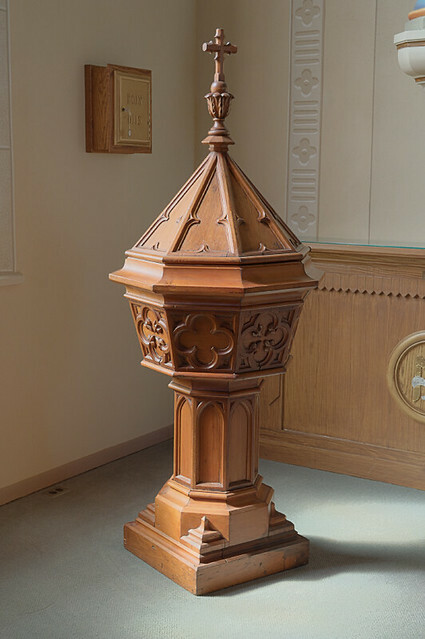 The baptismal font, with the holy oils ambry in back. The Blessed Virgin Mary, depicted crushing the head of the serpent, Satan. 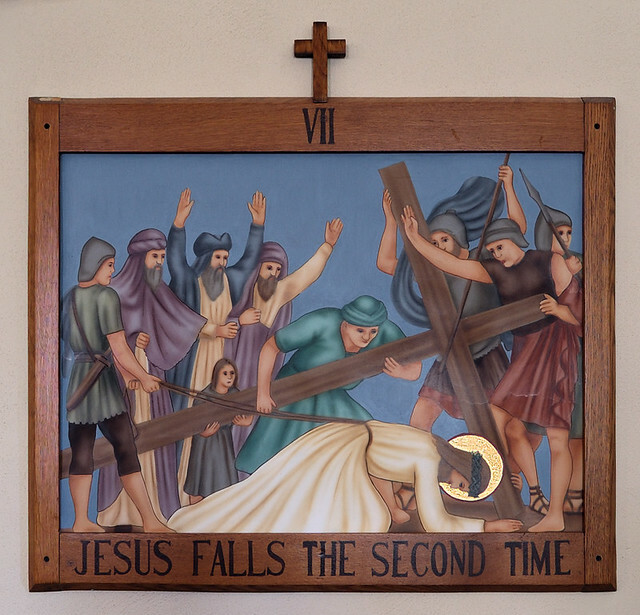 VIIth Station of the Cross: Jesus falls the second time. The Rectory. The church is located on a low terrace above the valley floor. Much of the town of Rhineland was relocated to higher ground after the Great Flood of ’93. Requiescant in pace. German names predominate on the tombstones of the church cemetery, located on the steep hillside above the church. We see below the flat floodplain of the Missouri River; two to three miles away are the bluffs on the south side of the river, near the town of Hermann. The Rhineland bluffs are about 400 feet tall, are made of dolomite, and extend for about six miles between this town and Bluffton. 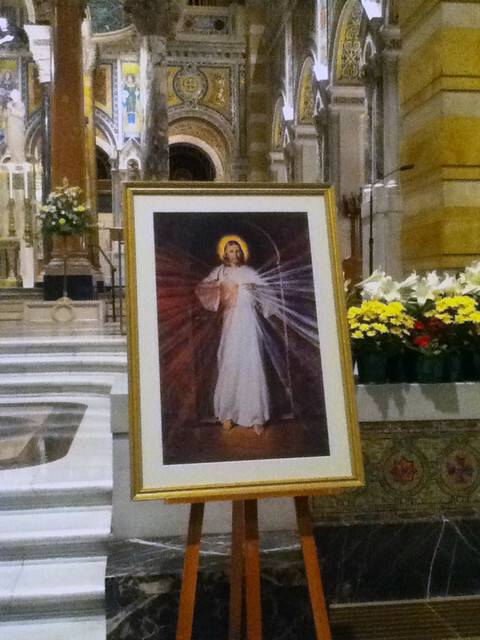 Image of the Divine Mercy, at the Cathedral Basilica of Saint Louis. The feast of the Divine Mercy, the first Sunday after Easter, was promulgated by Pope John Paul II in A.D. 2000. BEFORE EASTER, the secular media bombards us with anti-Christian propaganda. One thing we often hear is that “Easter” is pagan festival, that was “Christianized.” We are told that the word Easter derives from an ancient Germanic pagan deity. And so, Easter is suspect, isn’t really Christian, and we really ought not bother with going to church, and instead we should do whatever the politicians tell us to do. In most of these languages on this list, the local word for Easter literally means “Passover,” a very appropriate name. “Resurrection” is highly appropriate, and “Great Night” and “Great Day” point out that this is the greatest feast day in the Christian calendar — a feast day that begins the night before, with the Easter Vigil. Lent also ends, and so we can “take to the meat” once more, if our local Church has strict penances. 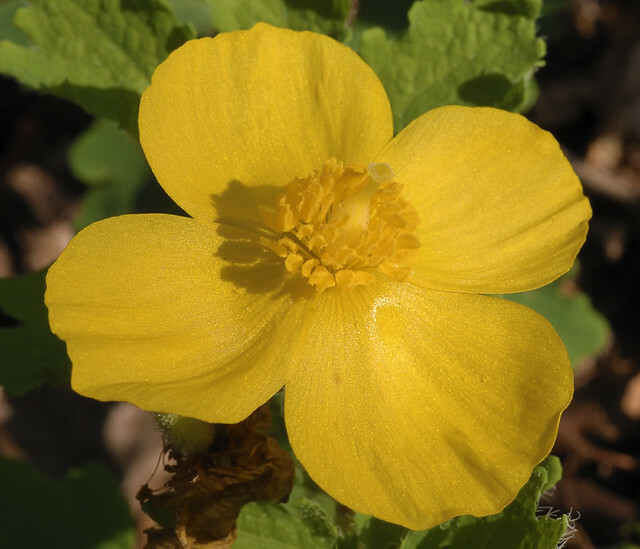 Eosturmonath has a name which is now translated “Paschal month,” and which was once called after a goddess of theirs named Eostre, in whose honour feasts were celebrated in that month. Now they designate that Paschal season by her name, calling the joys of the new rite by the time-honoured name of the old observance. The German word Ostern likewise has ancient roots relating to a Germanic deity. But the popularity of the word Ostern likely was reinforced by Luther’s use of the word in his German translation of the Bible, as the popularity of ‘Easter’ may have been strengthened with its use in English translations. I wonder how much influence the Reformation and Nationalism had on using these old names, rather than the Catholic name of Pasch? English-speaking Catholics do still use the phrase ‘Paschal Tide’ to describe the Easter season. However, both the words Easter and Ostern, despite their pagan roots, are related to the word “eastern,” the direction of the rising sun, and so are unexpectedly fitting names for the Rising of the Son of God from the tomb! The church dates from A.D. 2000, according to its cornerstone. 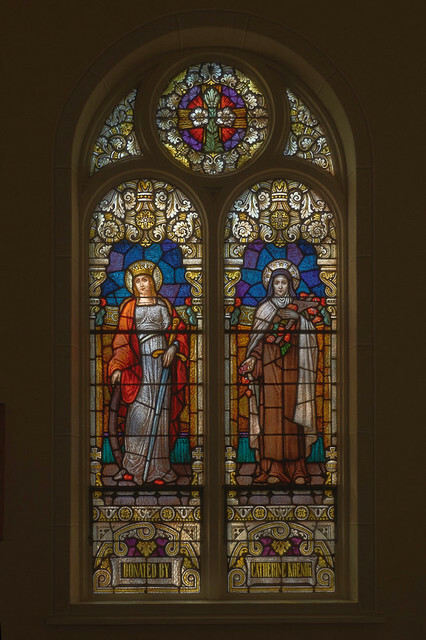 While superficially this appears to be an old window, this was made new for the church, by the Saint Louis company, Art Glass Unlimited. 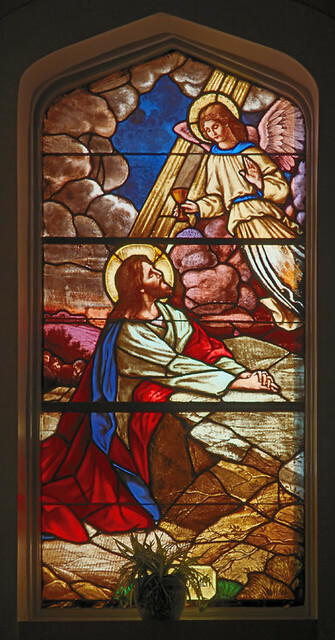 The depictions of Our Lord in this church’s windows show the Sacred Heart symbol. 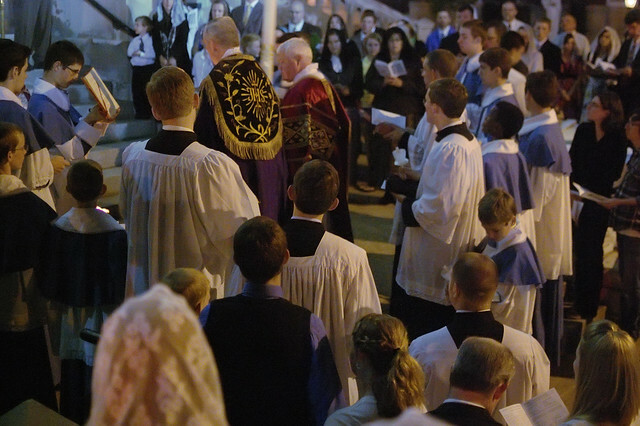 The Easter Vigil at Saint Francis de Sales Oratory began outside of the church. This photo shows the Paschal candle — a symbol of Christ Who is the light of the world. What's more, my publisher's website is now showing links to the table of contents and "Sample Text" of My Peace. The sample text is the first several pages of the book's introduction, which is also available as a free PDF download. Thanks so much to all the readers who have been praying for me as I have undertaken this work. Please keep up the prayers for me and for all those whom I hope to help find healing in Christ through the lives of the saints, particularly for adult victims of childhood sexual abuse. If you are a writer and are interested in interviewing me about My Peace or having your website be part of my upcoming "blog tour," please e-mail me. Is the My Peace tour coming to your town? Click here to find out. If I'm not yet scheduled to be in your area and you would like to engage me to speak about My Peace, please write to me: click here to see my e-mail address. Also, if you are in St. Louis or Jefferson City and would like me to speak at your parish, please e-mail me ASAP. I will be in your area in June for a friend's ordination and would love to give talks on My Peace while there. Dawn is not only an excellent writer, she is becoming a formidable theologian because of her studies with the Dominicans in Washington DC. ...the early Church called baptism photismos – illumination. lies open with greater light. and enters the waters of the ocean. he stretches out the day in a circle. and the bright stars show their joy. and the plant shines with its leaves. all the herbs smile with their blossoms. overcome the hunger of the husbandman. it is wont to give wine. prepares its bosom for bringing forth. carries off honey with its leg. the plants with their flowers express approval. having crushed the laws of hell. offer prayer to their Creator. all things with voice applaud. hence the vine, with its silent shoot, gives thanks. from whom at first the world derived its origin! which are fixed in their places flourish. which endured to be born and to die. in giving the aid of salvation. by the presence of the light. the thick pall of eternal night falls. I pray You, O power benign! that which is the ransom of the world. whatever sinks to the lowest depths. which flees from us at Your death. But returning, O holy conqueror! You altogether filled the heaven! becomes a prey to You. to the place whither their leader approaches. from the jaw of the wolf. ample trophies to the heavens. when the sacred laver blesses pure souls! and cleanse their old fault in a new stream. double talents to his Lord. He guards the fold of God. at the bosom of the Church. by the bounty of Felix. the beast of prey resembles the sheep. with the produce of an abundant harvest. a pure pledge to God. may another flourish gained from your people. — On Easter, by Saint Venantius Honorius Clementianus Fortunatus (ca.530–ca.600/609-10) He was a bishop, wrote many poems and histories, and his feastday is December 14th. 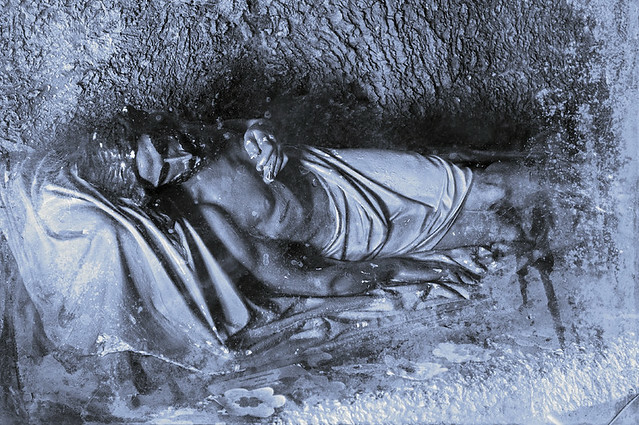 Christ in the Tomb. Image based on a sculpture found at the Shrine of Our Lady of Sorrows, in Starkenburg, Missouri. GOOD FRIDAY commemorates the passion and death of Our Lord Jesus Christ. Here are some of my photos of church art that depicts the Passion. 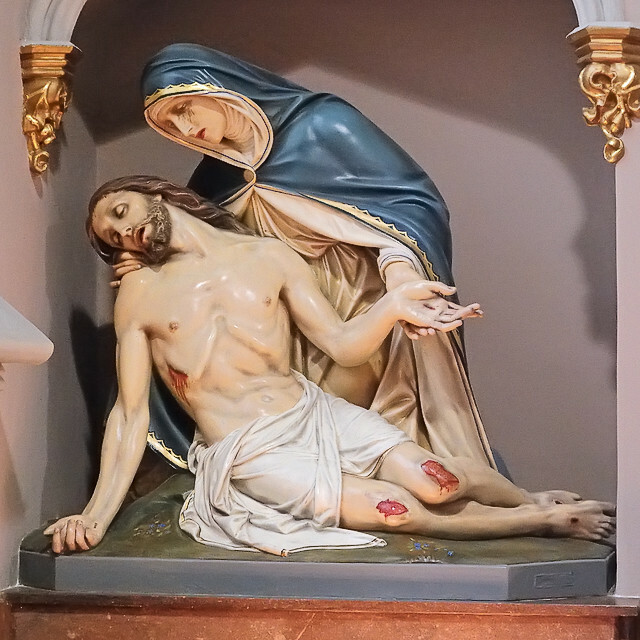 The Agony of Our Lord in the Garden of Gethsemane, at Saint Joseph Church, in Louisiana, Missouri. Photo taken in February 2011. Saint Joseph Church, in Freeburg, Illinois. June 2009. In Christ the King Chapel, at the Shrine of Our Lady of the Snows, in Belleville, Illinois. June 2008. Immaculate Conception Church, in Maplewood. May 2010. The Man of Sorrows. A statue of Christ after being scourged and crowned with thorns. At Saint Anthony of Padua Church, in Saint Louis. February, 2007. Mosaic of Jesus’ mother Mary, the woman of sorrows. On an outdoor altar at the Shrine of Our Lady of Sorrows, in Starkenburg. May 2007. Crown of thorns and nails, at the Sacred Heart shrine of the Cathedral Basilica of Saint Louis. September 2007. 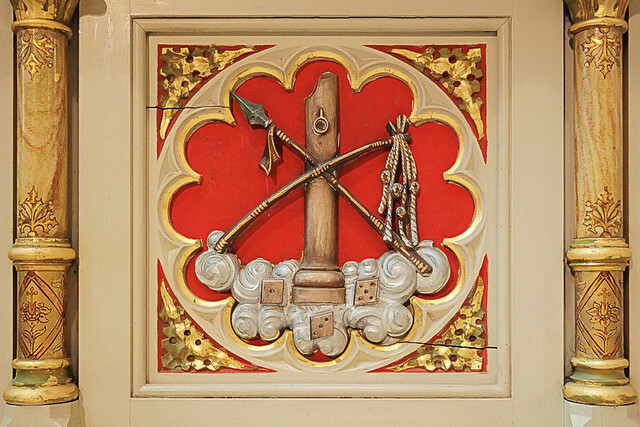 Sign of the Passionists depicts the three nails used to affix Christ to the Cross. The text, “Jesu ΧΡΙ Passio” is Greek and Latin for “The Passion of Jesus Christ”. At the Passionist Nuns Chapel, in Ellisville. April 2007. The Arma Christi, or instruments of Christ's passion and death, at the museum of the Basilica of Saint Louis, King of France, in Saint Louis. August 2007. Arma Christi, at Saint Francis de Sales Oratory. April 2011. Pontius Pilate condemns Jesus to death. Saint Bernard Church, in Albers, Illinois. November 2008. Saint Ann Church, in Normandy. April 2009. At the White House Retreat, in Oakville. February 2007. At the cemetery of Saint Boniface Church, in Germantown, Illinois. November 2008. 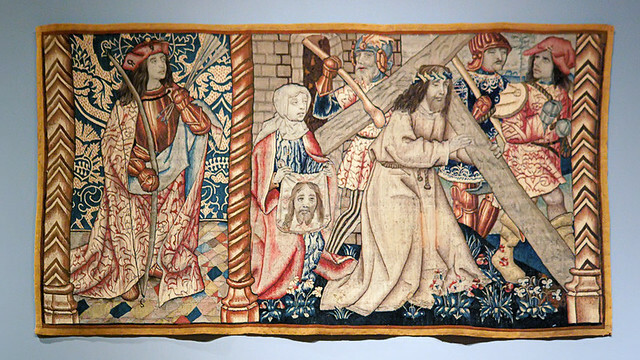 Jesus falls while bearing the Cross. 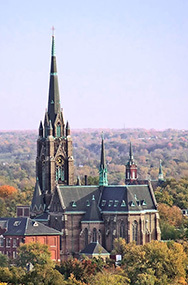 Cathedral of Saint Raymond Nonnatus, in Joliet, Illinois. September 2007. At Saint Mary’s Church, in Carlyle, Illinois. November 2008. Jesus meets His mother Mary. All Souls Church, in Overland. October 2007. Veronica wipes Jesus’ face. At Holy Family Log Church, in Cahokia, Illinois. July 2006. Tapestry at the Saint Louis Art Museum. September 2010. Jesus meets the women of Jerusalem. Saint John Nepomuk Church, in Saint Louis. April 2007. Jesus being stripped of His garments. At Saint George Church, in Hermann. November 2006. 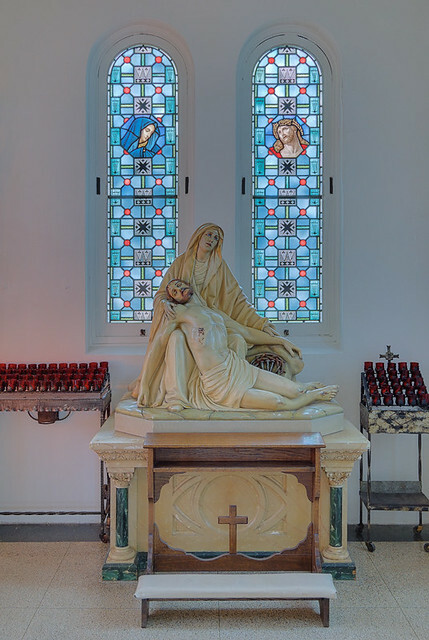 Jesus being nailed to the Cross, Saint Cecilia Church, in Bartelso, Illinois. November 2008. At Saint Mary’s Church, in Trenton, Illinois. November 2009. Saint George Church, in New Baden, Illinois. November 2008. The Crucifixion of Our Lord, at Our Lady of Lourdes Church, in University City. September 2006. At the Saint Louis Art Museum. June 2007. Processional crucifix, at Saint George Church, in Hermann. November 2006. At Saint Martin Church, in Starkenburg. May 2007. Saint John Nepomuk Church, in Saint Louis. April 2007. Altar crucifix, at Immaculate Conception Church, in Union. July 2007. At Mary, Queen of Peace Church, in Webster Groves. October 2007. At Saint Anthony of Padua, in Saint Louis. May 2008. Cathedral Basilica of Saint Louis. May 2008. At the museum of the Basilica of Saint Louis, King. August, 2007. Ste. Genevieve Church, in Sainte Genevieve. December 2007. At Saint Francis de Sales Oratory. September 2007. At Saint James Church, in Catawissa. October 2007. Jesus is taken down from the Cross. Saint Joseph Church, Apple Creek. December 2007. From the collection of the Western Jesuit Missions, at the Saint Louis University Art Museum. December 2006. 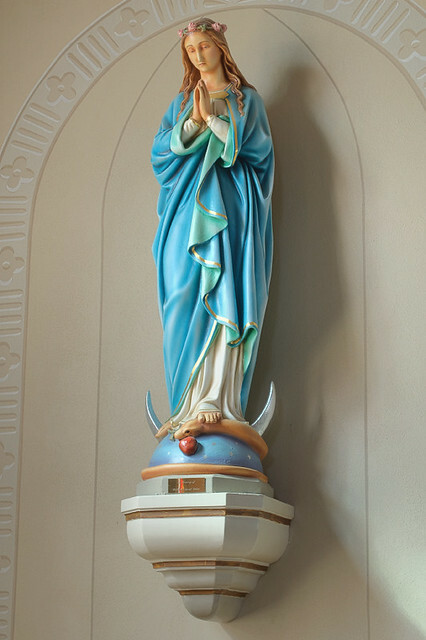 Mary holding Christ after being taken down from the cross. Our Lady of Sorrows Church in Saint Louis. October 2006. Our Lady of Sorrows Church. June 2008. At the Cathedral Basilica. January 2008. Saint Alphonsus Ligouri church, in Saint Louis. April 2011. 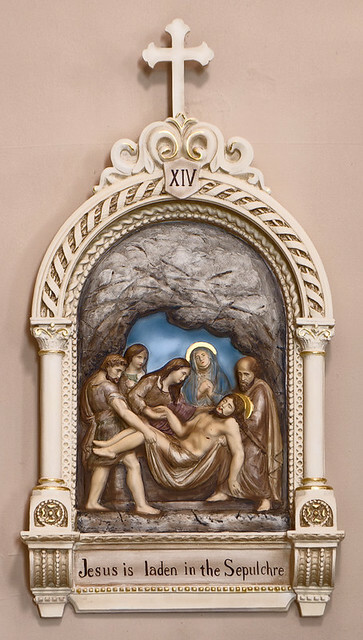 Jesus being placed in the tomb, at Saint Raphael Church, in Saint Louis. November 2006. 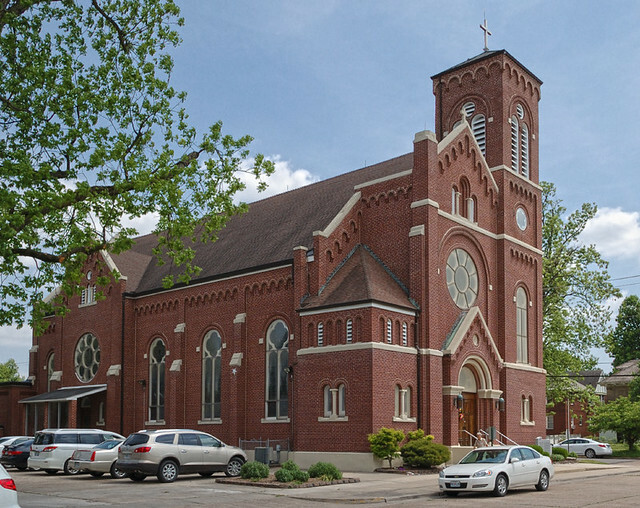 Saint Mary’s Church, in Alton, Illinois. January 2007. Saint Patrick Church, in Grafton, Illinois. October 2010. Please note that many of these photographs depicting the Passion of Our Lord were taken in the year 2007. My girlfriend Lisa died unexpectedly after a long illness during Holy Week of that year. I joined my suffering to that of Christ.